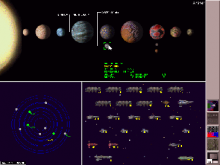 Star Control 3 is a video game developed by Legend Entertainment. They were hired by Accolade to create a sequel of Star Control II when the original creators Toys For Bob expressed no interest in creating the sequel with the same budget as Star Control II (which left them working without pay for several months). It was released for DOS and the Macintosh in 1996. A view of a in the game after colonization and ship construction. The game used a 2.5D form of melee combat, but 2D combat was still available. However, unlike SC2, all ship designs absent from the story mode were omitted (with the exception of the Arilou). The module tunes of the second game were replaced with MIDI music, and pixel animations for communication with aliens were replaced with rendered and digitized 2D graphics of live puppets. The gameplay was a mix of borrowing the melee combat and alien encounter dialogue trees from SC2, with new colony management elements which could be compared to Master of Orion. SC2’s resource gathering, and hyperspace travel gameplay elements were omitted. SC3's story expanded on the mystery of the Precursors' disappearance, and introduced new enemies in the form of the Hegemonic Crux. Shortly after the end of Star Control 2, hyperspace mysteriously collapses throughout the galaxy, stranding most space faring races. The Captain, living on Unzervalt, builds another precursor ship, with an experimental "warp bubble" drive that allows it to travel between star systems without using hyperspace. The Captain contacts the other races and they discover that the hyperspace collapse is somehow connected with the Rainbow Worlds, and that it originates near the galactic core in the Kessari quadrant. The Captain is sent to the Kessari quadrant with colony ships from several races to investigate and solve the problems with hyperspace. The Captain explores the Kessari quadrant, clashing with the local power bloc, the Hegemonic Crux, led by the Ploxis Plutocrats. During his investigation of the hyperspace collapse, a new threat becomes apparent - an ancient race called the Eternal Ones that consume the energy of all sentient beings once an eon are near to returning. It is revealed that to protect themselves from the Eternal Ones the Precursors genetically modified themselves to regress to the intelligence of a cow. They created semi-sentient robots, the Daktaklakpak, to reverse the process after the Eternal Ones left. The Daktaklakpak malfunctioned and forgot their purpose, leaving the Precursors stranded at that intelligence level. The Captain temporarily reverses the process on a single Precursor, who explains to him before its death that the only way to stop the eventual destruction of the galaxy is to stop the Eternal Ones as their unnatural use of interstellar fatigue will collapse the galaxy. The Captain then solves various problems in the Kessari quadrant, including persuading the Owa race to stop dumping their antimatter waste on Rainbow Worlds, which was preventing them from performing their function of mitigating interstellar fatigue, and breaking the power of the Hegemonic Crux, culminating in the defeat of a Crux Precursor battleship at the galactic core. The Captain finally meets with the Heralds of the Eternal ones at the galactic core, and after defeating them discovers that the technology they use to gather the sentience energy needed to sustain the eternal ones is 99.999% inefficient. Using this technology and various other artifacts and technologies from the Precursors and the Daktaklakpak, the Captain is able to construct a device that harvests the required energy in a non lethal manner. The Captain then gathers sentience from many Kessari quadrant races and uses it to sate the Eternal Ones. These are new species that you may encounter in Star Control: Kessari Quadrant. This page was last edited on 18 November 2017, at 03:17.